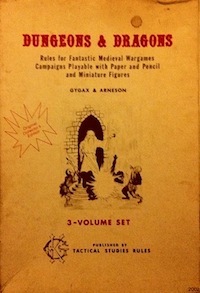 One of the primary lessons I have taken from my research into OSR design principles is that preparing too much, in addition to wasting time, can also actually result in a less interesting and more constrained campaign. Instead, it is better to pursue a “just in time” strategy. So, assuming I want to put this theory into practice, what is needed? There seem to be 2 categories of prep required: 1) setting & 2) rules (obviously there is some interaction between the 2, but I think it useful to consider them separately). Outcast adventurers, empty throne, squabbling nobles, mythic demihumans, dark fae elves, black magicians hunted, wizards unleash monsters, no dwarves or halflings, morlocks delve. We’ll see how that goes. I’m sure I’m overlooking something. I would even say that you don’t need a map handout for the players. Let them map it themselves, and then be amazed at how their take on what was described differs from the maps behind the screen. What about rules? Rules prep should includes what classes are allowed, how initiative is handled, etc. (A list of such common rules requirements would be useful to have, but I’m not going to do that here.) The way some people handle this is to essentially rewrite their own version of the classic rules. This is a wonderful thing, as it has given us products like Labyrinth Lord, Swords & Wizardry, and Weird Fantasy Roleplaying. (I realize that there are also other motivations behind the retro-clones and simulacra, such as keeping classic rules in print, but I don’t think anyone would argue that these products don’t also scratch the “this is what I play” itch.) But such extensive work is inimical to the core principle of “just in time” prep. Instead, assume a common baseline, and then come up with some notes explaining how the proposed campaign differs. Example: B/X D&D baseline, but without clerics, replacing the thief with the LotFP specialist. This will allow you to communicate your vision to someone that is not as obsessive about your setting as you are (probably all of your players). Divide the notes into the parts that concern the players and the parts that concern the referee. Each should become no larger than a single-sheet document. Situations that almost always require house rules (such as character death) should be included in the player’s document. The 25 word summary could also be the header of the player’s document, to quickly give a sense of the mood. This entry was posted in Uncategorized and tagged technique on September 22, 2011 by Necropraxis.